This is a typical requirement as a consumer who want an –all-in-one program that can handle both BD/DVD disc as well as video clips. While not all video converting tool can do that currently. Luckily, Pavtube Video Converter Ultimate program is the best choice for you to backup and rip Blu-ray/DVD movies, and convert video clips including recorded TV programmers to any other video format you like. Below is a brief tutorial to help you extract audio from recorded TV programs and convert Blu-ray/DVD movies to watch on TV. Click on the button “Add video”, navigate to file location of source TV programmers and import to the program. Tip 1: If your recorded TV programmers are Tivo recordings, don’t forget to key in media access key beforehand. 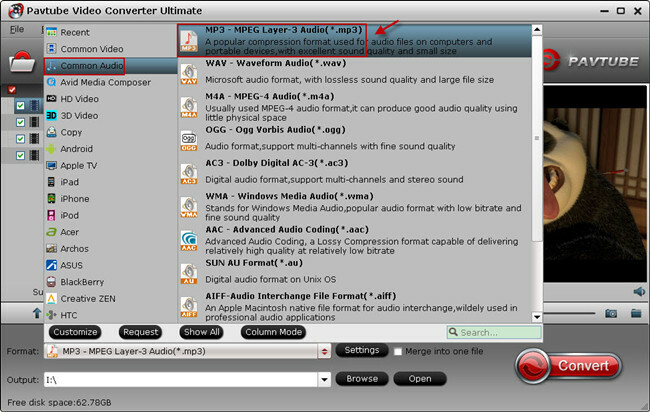 In order to play audio files in MP3 player, you are suggested to choose “Common Audio” > “MP3 - MPEG Layer-3 Audio(*.mp3)” as output format. Tip 2: If you like, customize profile presets are available. Enter Settings option, and you can freely set audio codec, sample rate, bitrate and channels in your own way. Back to the program main interface, and hit the big button “Convert” to start extracting audio from recorded TV programmes. This conversion progress should take few seconds and once it is complete, locate the extracted MP3 audio file and transfer to your MP3 player. Hit the “Load Disc” button to load source Blu-ray/DVD movie from disc drive to the best Blu-ray/DVD to TV ripper. The best way to watch source disc on your home TV with original video and audio quality is to copy movie content without extras, so you can choose “Copy” > “Directly Copy” for copying BD/DVD to TV with best video display. 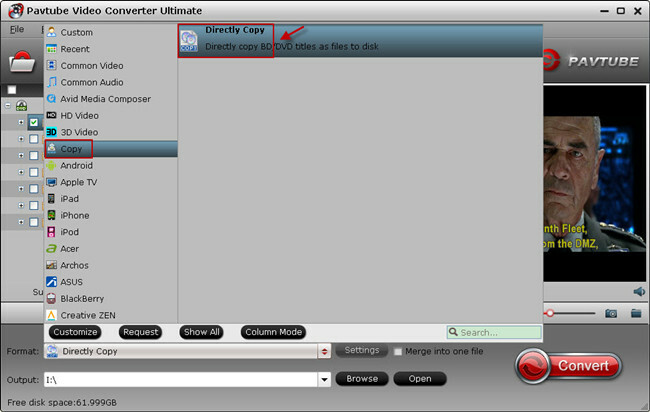 Tip 3: “Direct Copy” feature does not allow users to customize profile settings since it is 1:1 copying video and audio contents of original Blu-ray and DVD movie. 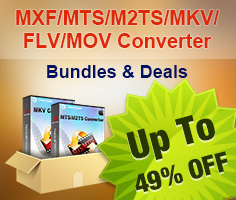 Tip 4: The copied movie from DVD disc is in VOB format and M2TS for Blu-ray disc, if your TV does not support the original Blu-ray DVD file format, don’t worry, Pavtube Video Converter Ultimate contains dozens of video types such as MP4, MKV, AVI, WMV, MPG and more, you would find the optimized video format for your TV eventually. 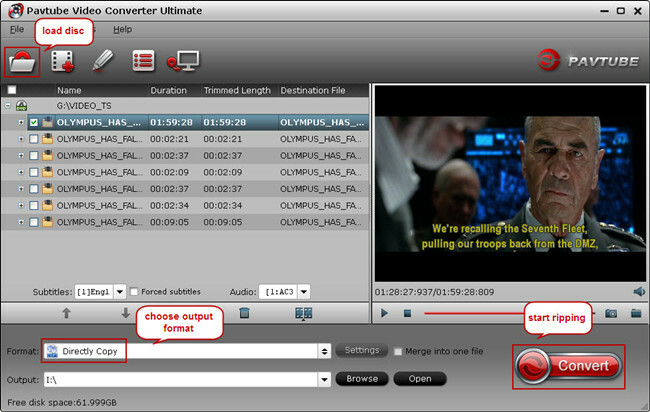 Last but not least, click on the “Convert” button and start Blu-ray/DVD to TV backup process. When it finishes, you would get a complete M2TS or VOB file located in output folder. Then you can move the copied BD/DVD movies to watch on your TV.